We ventured briefly out into the cold today. After struggling against the wind my kids became concerned that our chickens would blow away. I think the chickens will be fine (I hope), and I know something for sure: I don’t like the wind. I’m completely against it. But since it does me no good to resist the fact that the wind will blow, I can instead stay safely indoors and sip some hot tea while I watch limbs fall of my trees. I love to use warm spices in cooking and baking. Each one has an aroma and flavor that wraps a thick blanket of happiness around me. And although these spices each offer their own health benefits, it’s that magical warm feeling that keeps me sprinkling them into everything I can. I start off my mornings with coffee to which I add cinnamon, clove and vanilla extract. I put these ingredients right in with the coffee grounds to infuse the whole pot of coffee with their goodness. For breakfast I add these same spices, and maybe some ginger or nutmeg, into oatmeal or in baked apples. 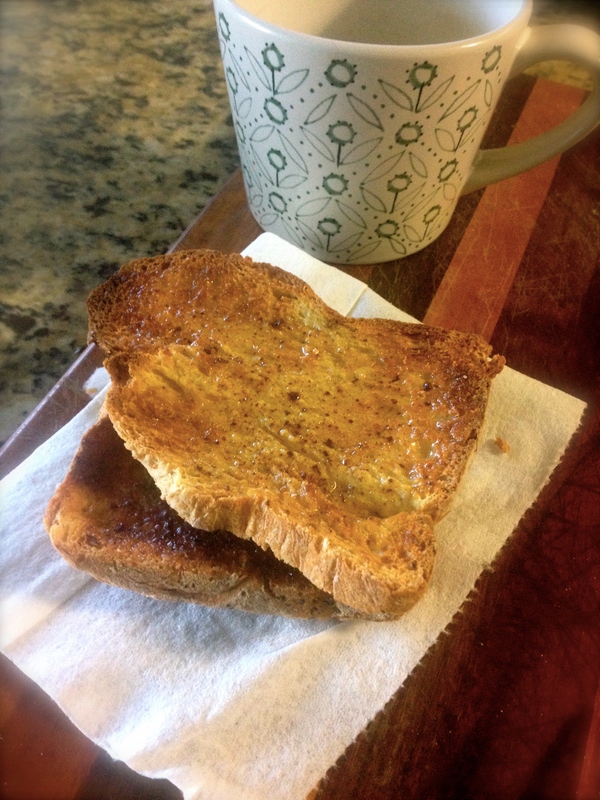 Or I may have a slice of toast with butter and cinnamon. My kids enjoy plain full-fat yogurt mixed with banana, raw honey and cinnamon. Chai tea is a black tea made with ginger, cardamom, cinnamon, clove and black pepper (all warming spices), and is a delicious alternative to coffee. Or you can be adventurous and try turmeric tea by simmering turmeric, cinnamon, clove, ginger, and vanilla bean in milk (strain into a cup before drinking). My homemade kombucha has recently been flavored with ginger, and apple cider (another good warming drink). For lunch or dinner make meals that contain warming spices, like Indian dishes, or various Asian dishes that use ginger, garlic and/or chiles. Garam masala is an Indian blend of spices that will warm up any dish. You can find a recipe online or purchase it already prepared from the grocery store. I know it’s early in the season, but around here a lot of us eventually feel a little malaise as the cold/cloudy/rainy days continue. We were fortunate today; despite it feeling like the temperature of a refrigerator, the sky was blue and the sun bright. But after getting pushed around by the wind earlier I’ll keep myself inside and wrap my hands around a cup of hot chai tea.